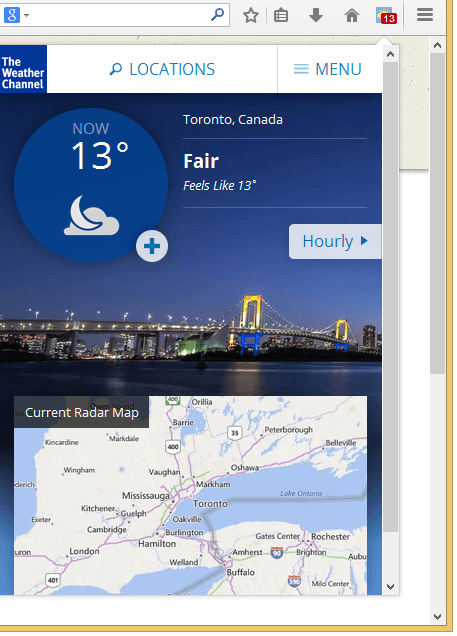 "Weather Forecast" integrates the Weather Channel Mobile Site into your browser. Using this extension, current temperature is shown in the badge area and current weather condition is shown as the toolbar icon. These indicators are frequently updated to alert you of the changes. For more info on weather condition open the panel UI. Please note that the primary role of this extension is to provide an easier method to check weather through the Weather Channel website and there is no intention on misleading that this product is an official product of the Weather Channel. How can I reposition the toolbar icon? In Firefox browser, toolbar icons can be reposition through Customize Panel. Please follow a Comprehensive Guide to Firefox Customization for more info. How to convert temperature unit from Fahrenheit to Celsius (ºF to ºC)? Open the panel, then on the top right side go to the "Menu". Now scroll down to "Settings". There is a section in the "Settings" panel to convert the unit. To Enable Panel View Type "chrome://flags" in the addressbar then Press Enter in the Flag's page Search for "Panels" and Click on "Enable" then Restart Chrome. You should see the Panel view if you click on the Yahoo Mail icon. When I click on the toolbar button, a blank panel opens. Why? If you have NoScript addon (or anything similar) installed, please make sure you can open http://m.weather.com/weather/today in your browser. The panel is not loading the weather channel anymore. How can I fix this? On Chrome/Opera simply delete the extension and install it from web store one more time. In Firefox, go to "about:config" and look for extensions.jid1-aqwHRwQpv3JUMs@jetpack.new-location preference. Right click on it and press reset.